Finding your Perfect 30A Rental. 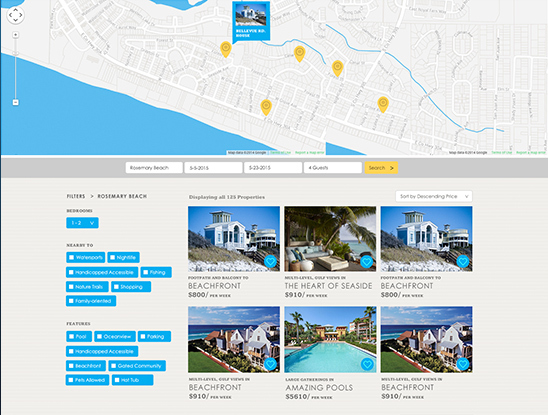 Rent30A is an online hospitality service that showcases rental properties in the panhandle of Florida with locations including: Seaside, Rosemary Beach, Seagrove, Watercolor, Watersound, Inlet Beach, Grayton Beach, Seacrest, Gulf Place, Blue Mountain Beach, Dune Allen, Alys Beach and Santa Rosa Beach. Along Highway 30A, one will discover a stretch of paradise with breathtaking views, dream homes and pristine white-sand beaches. 30A provides a unique experience, featuring an old world style of European cottages in an intimate Southern-hospitality setting. It’s the kind of place one visits the first time and continues to visit for a lifetime. The biggest gap the online hospitality industry faces is the disconnect between the traveler’s understanding of location and desired destination options. 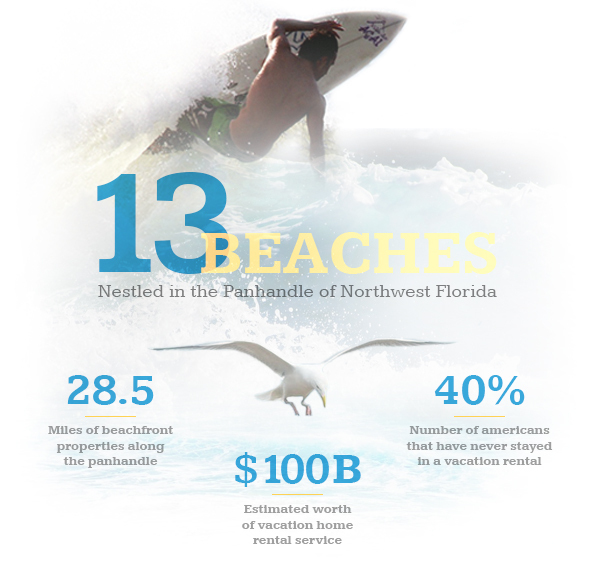 The market is flooded with hospitality options and vacation destinations. The biggest hurdle was to differentiate the Rent30A from competitive sites such as VRBO, AirBNB, Roomorama, Flipkey, etc. By designing and promoting a highly customized and localized online property rental experience in scenic Highway 30A. We marketed the entire experience of what makes 30A world famous. 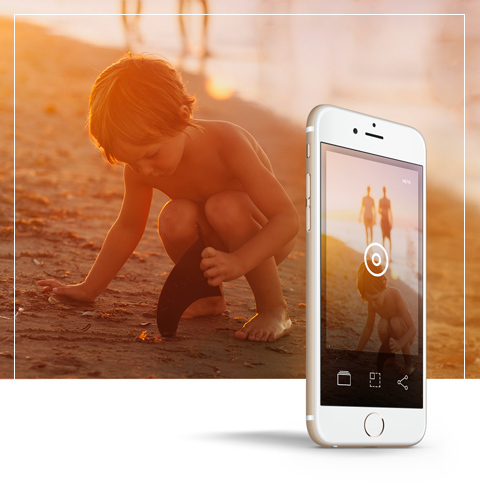 We wanted users to capture the heart of the culture, community, people and events at 30A. 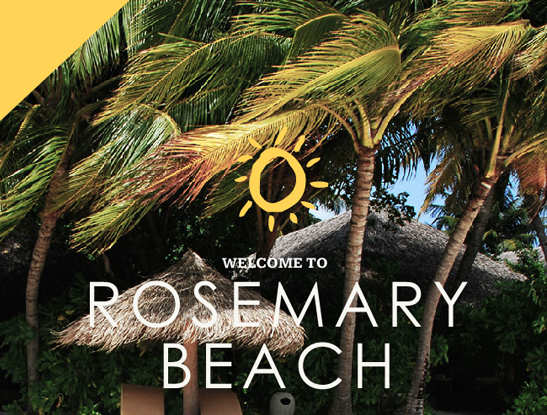 It was not enough to experience the comfort of a property through your screen, but we wanted to capture the very essence, sounds, smells of what it would be like to vacation in this haven, and bring it to the forefront of the online searchable community. We were intentional about making the customer feel valued: their time is our time; their interest our interest. We did not want clients to come to the site and feel like they were making searches and getting a wide range of results that did not help them feel closer to their dream vacation. What was the solution? A highly powered search filtering system allowing users to select specifics in their searching results, including: bedroom(s), guests, arrive/depart dates and amenities such as wireless internet, if pets are allowed, grills, close proximity to the action, etc. If other hospitality services inundate you with hundreds of listings, we wanted to provide hand selected real-time properties that fit all their specifications. What is special about 30A is the tight knit community, that sense of feeling like family. It was important to us to provide that experience on the Rent30A website. 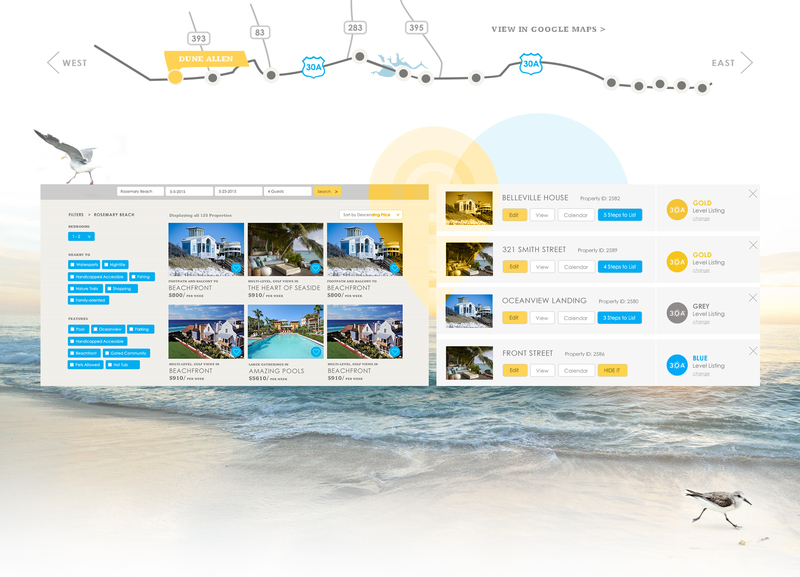 We worked closely with the executive team of Rent 30A to outline customer journey maps and designed a custom platform allowing the traveler, broker and property owners to set their interests, their dream vacation, by giving them a fully customized dashboard that keeps track of all their preferences. 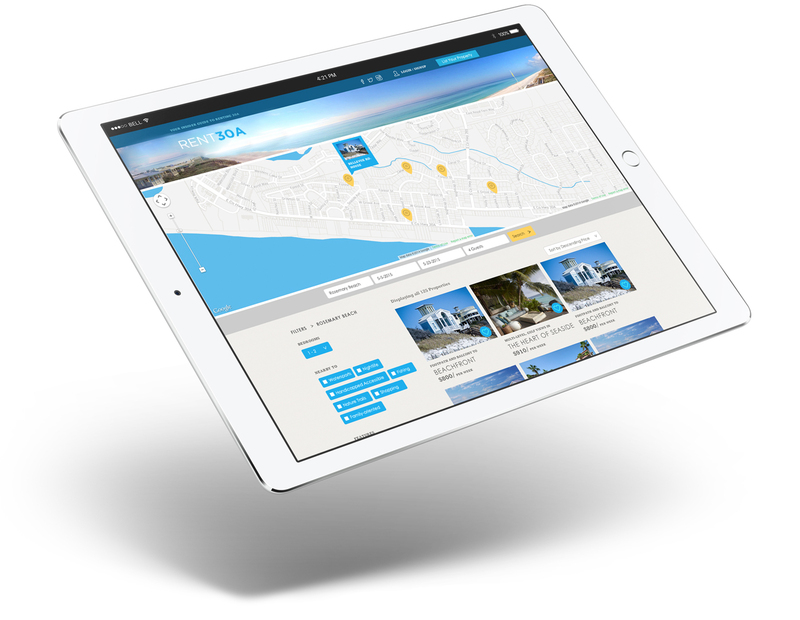 The owners and brokers also have a custom account center allowing them to set seasonal rates, availability, promotions, advertising, amenities, notifications, wish lists, transaction history and much more capabilities. 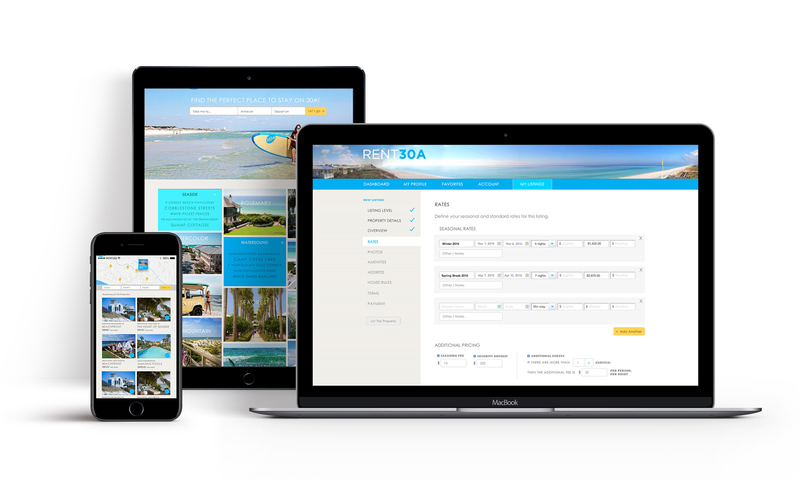 Rent30A disrupts the existing listing platform concept and creates a hyper-localized and user-customized experience (i.e., what to do, where to go, events happening around a customer’s booking time-frame, deals and best-rated spots by the locals, etc…). 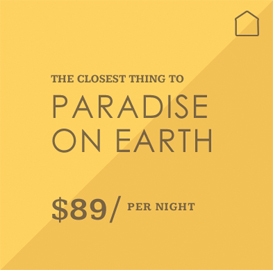 John Dalton, chief marketing strategist for the Onsite Property Management Association, said, “Alternate lodging is going to become primary lodging — the market has no ending, none at all.” Now, Rent30A can compete in this market, set the trail for the future and most importantly help connect 30A travelers with their dream vacation rental home. It is not everyday one can say we contributed to making life memories for families. That’s the ultimate reward.